Stories abound regarding this gentleman vagabond and his title! How and why he received this nickname is a matter of conjecture and discussion as he did not have any family connections with France and was clearly not the holder of a royal title! Cuban National Archive material suggests he arrived from Spain with other family members at the age of 14 in 1913, and died aged 85 in Havana in1985. At the time of his death his body was buried at the cemetery of Santiago de Las Vegas but has since been removed to the church of San Francisco de Assisi where his statue stands today. He lived a relatively “normal” life in Havana, being employed in a variety of positions, among these, waiting at tables in Hotels such as Hotel Iglaterra and Telegrafo on Parque Central and possibly working in the offices of legal establishments. What event catalysed his opting for a vagabond life is not clear. Some say that he was imprisoned for a crime he did not commit and that his imprisonment experiences had such a profound effect upon his state of mind that when released he took to the streets. What is certain is, that post revolution, he became a familiar figure in the old city greeting and talking to everyone he met. He would talk to anyone and everyone and was always friendly and kind. He never used bad language and had an excellent command of the Spanish language which he spoke well, exhibiting a broad general knowledge of the world of literature, poetry, and history. He was famous for his story telling and he spoke in an eloquent, interesting and engaging manner. People said he made up stories, and maybe he did, but his stories were historic and anecdotal about Cuba and the world. Everyone wanted to talk to him, young and old and say he had a calm and very relaxed manner which people found compelling and attractive. People would see him writing and he always carried a portfolio full to overflowing with papers and magazine or newspaper articles about interesting subjects that he would talk about and show or give to people with home he conversed. It’s said that he liked to give flowers to ladies and feather quill pens which he made himself to children. Although he never himself married its believed he had two children. His appearance was unique! Never mind the weather he wore a black suit, shirt and tie and proper shoes, always well presented but invariably very dirty. His hair was long and he had a goatee beard. His nails were said to be long and curling!!? 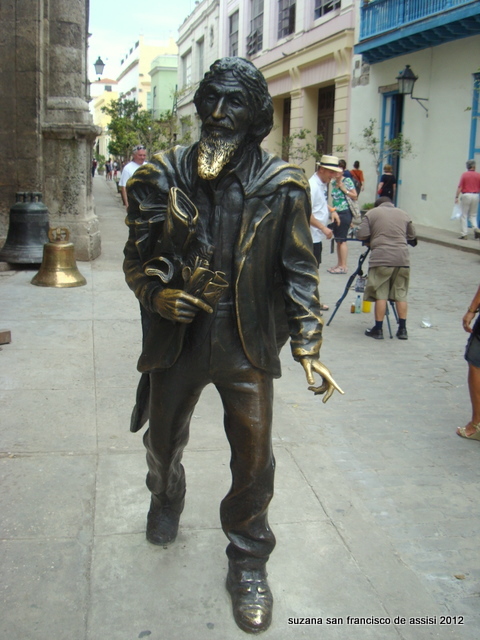 He frequented the Paseo de Prado and Parque Central,, Plaza de Armas, and other parts of the old city centre, sometimes he would be seen in central Havana and travelled on the buses. 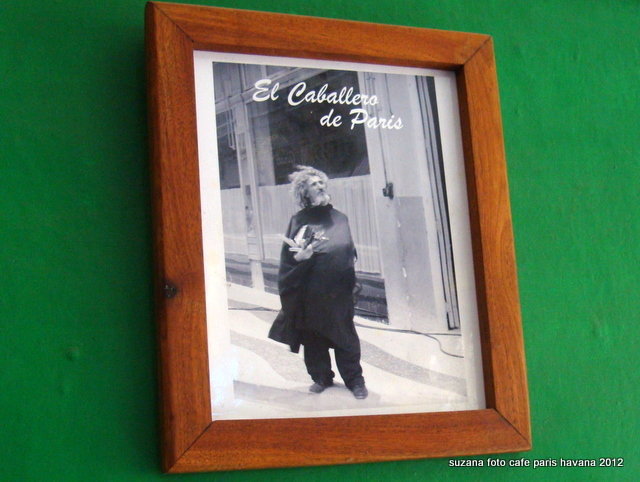 He was a familiar face to all who lived and worked in old Havana, and people today will recount with affection their meetings with him, how he spoke and how he dressed having made lasting impressions on them. People would give him money and food although he never asked for anything. At some point it was noticed by some persons in authority that his state of health was deterioration and he was taken to a hospital where he was placed under the care of a Dr Calzadilla a psychiatrist who has written about his case. 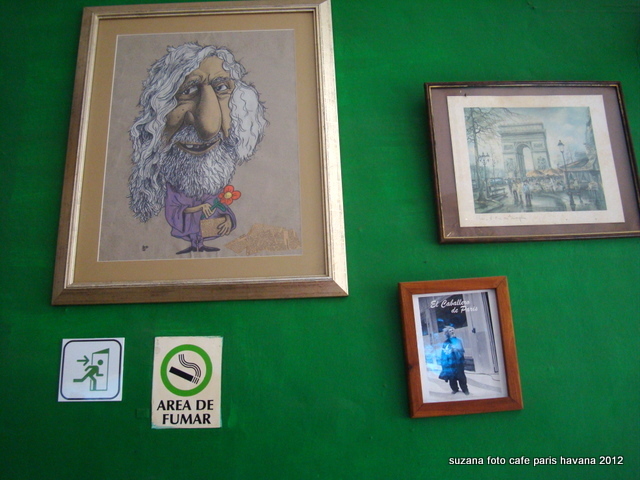 Since his death one of the bars in Obisbo has been named Café Paris and you can see one or two photos hanging there plus a drawing. Havana still has its fair share of street vagabonds but no one quite as colourful or delightful as the Caballero de Paris.